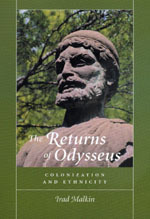 Malkin shows how the figure of Odysseus became a proto-colonial hero whose influence transcended the Greek-speaking world. The return-myths constituted a generative mythology, giving rise to oral poems, stories, iconographic imagery, rituals, historiographical interpretation, and the articulation of ethnic identities. Reassessing the role of Homer and alternative return-myths, the book argues for the active historical function of myth and collective representations and traces their changing roles through a spectrum of colonial perceptions—from the proto-colonial, through justifications of expansion and annexation, and up to decolonization. Irad Malkin is Professor of Ancient History at Tel Aviv University and author of Religion and Colonization in Ancient Greece (1987) and Myth and Territory in the Spartan Mediterranean (1994).